Vodafone India has now launched a Rs. 1,699 recharge plan and started discontinuing the Rs. 1,499 recharge plan that debuted earlier this month to sit alongside Bharti Airtel and Reliance Jio that both are offering an identical option. Just like the original Rs. 1,499 recharge option, the Rs. 1,699 Vodafone recharge brings benefits such as unlimited voice calling as well as 1GB 4G/ 3G data per day for as many as 365 days. The Rs. 1,499 recharge also offers access to the Vodafone Play app to watch live TV, movies, and other online content. As per the listing on the Vodafone website, the Rs. 1,699 recharge plan brings unlimited local, STD, and roaming calls within India alongside 1GB 4G/ 3G data per day. The new recharge option for prepaid Vodafone subscribers also includes 100 SMS messages per day as well as access to the Vodafone Play app. All the benefits under the Rs. 1,699 recharge plan are available for 365 days. Furthermore, the new option is available as a bonus card initially in select Vodafone circles, including Haryana, Kerala, Mumbai, and Punjab. 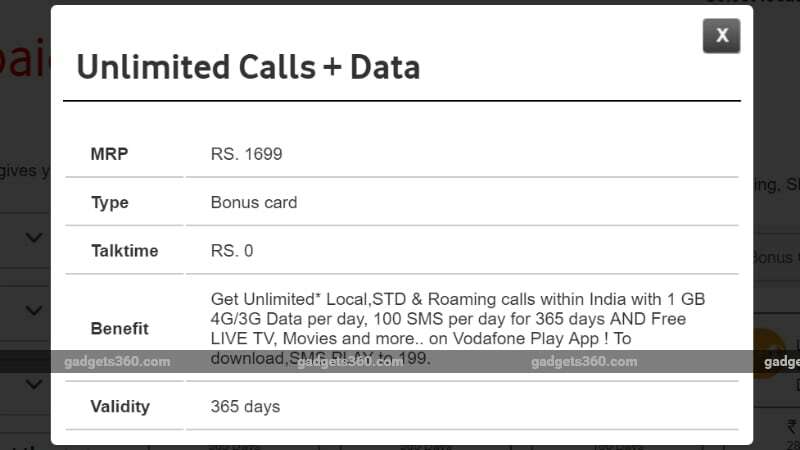 Prepaid Vodafone subscribers in the eligible circles can choose the Rs. 1,699 recharge by directly visiting the Vodafone.in site or through the My Vodafone app. As we mentioned, the Rs. 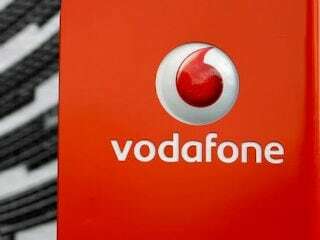 1,699 Vodafone recharge plan comes just days after the telco brought the Rs. 1,499 option. The original move was aimed to take on the Rs. 1,699 recharge offered by Airtel and Reliance Jio. However, the Rs. 1,499 plan has now started been discontinued and replaced with the Rs. 1,699 recharge, at least in some circles. Some circles show both the Rs. 1,499 and Rs. 1,699 recharge options. The Rs. 1,699 recharge plan from Airtel offers the same benefits as the new option by Vodafone. However, Reliance Jio, in contrast, offers 1.5GB 4G data per day alongside unlimited voice calls and 100 SMS messages for 365 days to attract customers. This means the Jio recharge offers 182.5GB of additional data benefits over those provided by Airtel and Vodafone. State-owned Bharat Sanchar Nigam Limited (BSNL) also has the Rs. 1,699 recharge plan to offer 2GB data per day with a validity of 365 days. Under the Bumper Offer, the operator is giving even 2.21GB additional data per day.